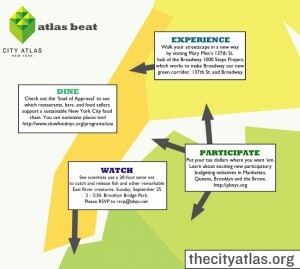 We are thrilled to announce that the City Atlas is now launched and running. We are still in a beta testing mode, but all of our content is up there and the site will be functioning, updated, and utilized from now on! Please do come and check it out for your self but a recap of what it actually is can be found below in our press release. We are grateful to everyone who has helped us make this happen, a great team, supportive sponsoring Institutions and of course the Rockefeller Foundation who provided the initial award for this project through the Cultural Innovation Fund. We don’t actually think we could sum the Atlas up better ourselves, so I leave you with the words of Edwin Torres, the Associate Director at the Rockefeller Foundation. He said, “The Atlas is about climate change communications, about using lived culture to affect climate impacts.” Pat on the back for New Yorkers!! which some might say we don’t need another one of. But in all seriousness, the Atlas is about building the support for the work people are doing, and getting more New Yorkers involved. And yes, a polished, and accessible website is critical for that these days. So, enjoy. Participate. Give us feedback while we beta test. People | We ask New Yorkers–everyday people and experts alike–to share their thoughts on the city’s present and future. The weekly ‘Atlas Beat,’ which is pictured above, will feature a map of our top listings for the week, including current events, new ideas, and fun facts.